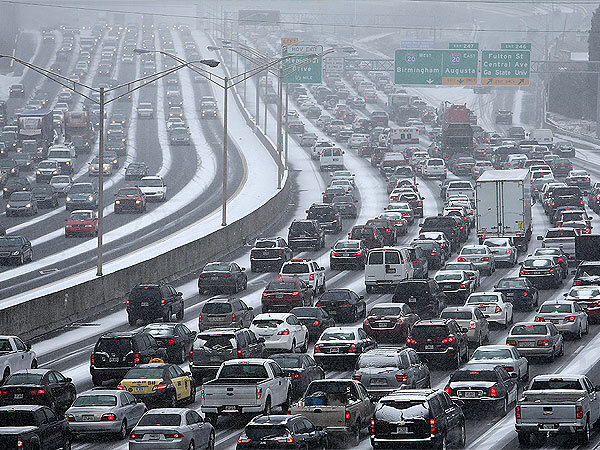 The mayor of the city of Atlanta was fighting for his life this morning, after the city became paralyzed following the massive snow and ice storm, “Leon.” Hundreds of people spent the night stranded on freeways, at work, and in Home Depots (and who knows where else). A woman reportedly gave birth in a car, and more than two thousand children and their teachers were stranded at school overnight. 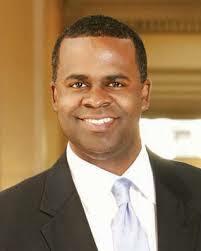 Kasim Reed’s political life, that is, is suddenly in critical condition following an interview with CNN’s Carol Costello. During the segment, the mayor appeared to accept no responsibility for his part in the failure of the city to adequately prepare for the inclement weather. The media and citizens across the nation are appalled at the city, and state government officials, and their blame-shifting antics following the disaster. The CNN website is flooded with accounts of the misery there. When you clearly drop the ball, the best thing to do is pick it up, and accept responsibility! Then move forward. At this point, who is to blame is the small issue. The bigger issue can be summed up in one question: “Now What! ?” Really, there is no gear that the city can shift into as of noontime Wednesday, to erase the cold, hunger, fear, and danger from the minds of the people of Atlanta. Further, if the National Weather Service alerts us that a storm is coming, and issues a WINTER STORM WARNING, you can kiss the baby! They did just that as early as Monday night! I live more than ten hours northeast of Atlanta. Eastern North Carolina schools dismissed as early as noon on Tuesday. We knew to get to the store, run our errands, and to be in place by the time the first flake fell. To argue that Atlanta doesn’t get snow regularly falls on deaf ears when the city went through a similar situation back in 2011. Reportedly, there were about four salt trucks available at that time. Currently, the city is said to have more than 70 trucks. In any case, officials have been reactive rather than proactive in both cases. Lets recap. It’s the meteorologists’ fault for forecasting the wrong total (one inch off is just unconscionable!). It’s the school system’s fault for not dismissing school earlier. It’s the state’s fault for not taking care of the interstate. Great! While the finger is being pointed passed around like a hot potato, the sun will set in less than six hours. Enter day two. Who’ll be the blame for that? Let’s see if God will be available for an interview later. If He is, I hope He’s ready for Carol Costello. Shes a beast! Ultimately, it is my sincerest hope that the entire city returns to normal as soon as possible. I’m finding this a bit late, but in all honesty for as bad as that week was, what appalled me even more than that was trying to find anything worth buying that had any sense of nutrition within before last weeks storm here in Atlanta. Attempting to go to the store brought empty shelves, it didn’t matter what you tried to buy they were out of it days before the storm came, and when you’re someone like myself just trying to go in to do normal grocery shopping, it’s even more frustrating, because people decide to be food hoarders and buy 8 loaves of bread at a time. (I mean seriously come on). As for the last week of January that really was despicable, I’m from Northern NY originally, where they’ve gotten literally 12 feet of snow in the last two weeks, and each time that this happens around here it disgusts me even more, because the city, and state government refuses to prepare for winter weather conditions in a way that actually benefits the people that live in this state. I don’t need to go in to detail about what the conditions were like on those roads, but what I will go in to detail about is that you had people with medical conditions stuck on the interstates all throughout the night, you had women having babies, you had people who were literally on the verge of passing out, because they were diabetic, and one account actually noted that an ambulance refused to transport a woman who was going in to diabetic shock around 2 am who had been trapped on the interstate since 1pm the afternoon before that. How sad is that? The state and city let us all down, there’s just nothing more to say about it, I’m sure it’s pretty safe to say that they’ve lost any chance of re-election after that nightmare. Wow! I’m sorry you experienced that first hand! I suppose winter weather seldom happens there, and the officials don’t want to invest in the equipment. However, I do hope that in the future, Atlanta will not take chances on school and commerce during a winter storm warning! Agreed, I actually live in the county where the majority of those students were trapped, and several of us that are from the north, and know how to drive in it, went to the schools in order to get the kids that we knew (with parental permission) we kept making runs until we couldn’t any more. Friends of mine actually hosted numerous kids because their parents were stuck in traffic in various areas of the metro area, it’s just an all around sad memory of how our own local government failed us. Churches opened their doors, grocery stores were giving away and even preparing food for trapped motorists that chose their facilities to remain in for the night, chic fila gave away free food to stranded motorists, and actually sent employees out on the interestate with trays, and bags of chicken biscuits, chicken sandwiches, and bottles of water. It’s a wonderful thing when communities come together, and help one another out in need, I just find it incredibly sad that our local government doesn’t take preventative measures to ensure that this doesn’t keep happening, but yet, it does, because they refuse to understand that you can’t control the weather, and just because something doesn’t normally happen, that doesn’t mean that it won’t, and as a result this is what happens when it does, you have an entire metro area that is shut down, unable to function, unable to do business, and it creates a chain reaction for millions of people both located in the Metro atlanta area, as well as all over the country when businesses have products to sell, but those products can’t get shipped out, because all of the roads are shut down. Ok I’m done with my rant now, this was really a great post, a bit of a shocker considering you didn’t experience it directly yourself. You definitely nailed it, but I’m sure CNN, and other media sources as you stated in your post definitely helped a lot.